This was more like it. Liberal head coach Drew Gruver was waiting for this kinds of effort from his team. 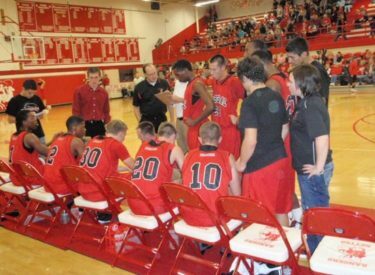 His guys were diving on the floor for loose balls and playing more aggressively on defense forcing many Perryton turnovers in Liberal’s 67-52 win over the Rangers in Perryton Friday night. "I thought we played really hard," Gruver said. "We had a couple guys who haven’t really dove on the floor getting after loose balls tonight and as a coach that’s what I like." Liberal also got some shots to fall. Coming into the game, LHS was shooting 35 percent from the field and made only nine three pointers in four games. Friday night, the Skins made five three pointers in the win. Liberal probably played their best basketball of the season in the first quarter building a 24-12 lead. It was 43-28 Liberal at halftime and 51-37 at the end of three. Jade Cathey scored 26 including a one handed dunk in traffic. Kenlee West added 10 including two three pointers. Slader McVey added nine points on three three pointers. The Redskins are 3-2 while the Rangers fall to 9-6. Liberal plays at Ulysses January 4.